As we begin to look forward to the end of hurricane season, we can’t help but to reflect on the many businesses and communities who have stayed strong and began to rebuild after disaster struck. As providers of a large inventory of restroom trailers, we have been out in the field, delivering trailers to the businesses, organizations, and communities that need them to provide relief. From energy companies to rotary clubs, we have gotten to build relationships with a wide variety of businesses and organizations. All are in some way an important part of their community, and we were so happy to help them get back on their feet. Each company or organization has a specific role in a community, whether that’s providing a specific service that keeps the city running or providing smiles during the weekends. We recently partnered with Wrightsville Brewing Company and enjoyed learning about their place in Wilmington, NC’s community. Wrightsville Beach Brewery was the brainchild of three oystermen. The region is well known for it’s high quality oysters, and since, to these guys, beer and oysters go hand in hand, they couldn’t believe that the area had no local brewery. So the area’s first brewing company was born. They have chosen to make it their mission to not only brew delicious beer, but just as importantly, providing customers with information about taking care of their natural environment. The brewery is known for sustainable practices and encouraging the community to adopt more sustainable habits. 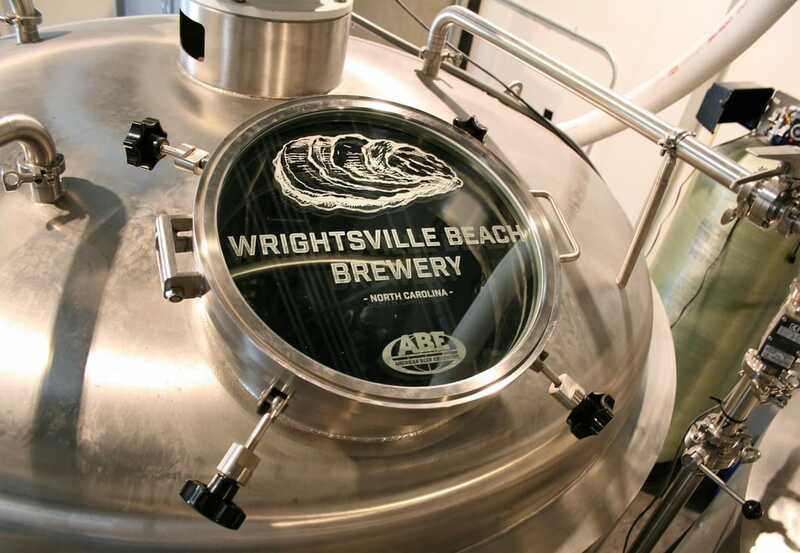 Like many businesses affected by the hurricane, Wrightsville Beach Brewery had many amenities that were not available for employees and guests, including restroom access. The restroom was in need of rebuilding, but the brewery knew they needed to reopen their doors and get business running again. Restroom trailers were a convenient, affordable, and fast solution for them. We were happy to work with them and find a restroom trailer that matched their needs. Given their moderate amount of use and need for a quick solution, we suggested the 2 Station Portable Restroom Trailer, Cabo Series. This style of restroom trailers is compact, measuring 12 feet in length. This makes it easy to move and versatile enough to fit in any space. With a 370 gallon waste tank and 125 gallon fresh water tank, this restroom trailer is ideal for servicing a moderate crowd throughout the day. Like with many of our restroom trailers, guests are greeted by a cleanly designed exterior that is dent and scratch resistant. Sturdy aluminum steps and handrails are provided for safe and easy access, and entrances to both doors have ample lighting as an added safety measure when it gets dark outside. This Cabo Series includes one women’s suite and one men’s suite. The interiors of both suites are designed with a earth tone interior with many designer touches. Each suite includes water-saving china pedal flush toilet, toilet-paper holder, wall-to-wall lockable vanity with solid surface countertops with under-mounted designer sink, large shatterproof mirror, metered faucets, and in-counter wastebasket with soap and paper-towel dispenser. The men’s suite also includes a water saving urinal. To ensure that the interior temperatures stay comfortable inside our restroom trailers, we offer a variety of seasonal packages. The trailer for Wrightsville Beach Brewery was equipped with the 4 season upgrade. Though all of our restroom trailers come with insulated walls and air conditioning and heat strips, the 4 season upgrade adds to these measures to keep the interior temperature comfortable. Restroom trailers with the 4 season upgrade can withstand weather as low as -20 degrees due to added insulation. They also include tank de-icing systems, R13 underfloor spray insulation, heated water hose, foil wrapped exterior, 40k BTU ducted furnace, 2-30lb LP tanks mounted on front, and 2-30 amp marine-style power cord upgrade. A restroom trailer with these upgrades is ready to take on winter! A final feature that comes with this and many of our restroom trailers is the Smarter Restrooms App. This app is a revolutionary tool that allows the restroom’s maintenance team to control aspects of the trailer remotely from a smartphone, tablet, or laptop. Easily maintain systems operations with the ability to monitor waste levels, freshwater tank levels, power, and interior climate control. Due to our ability to hand pick a perfect restroom trailer option for the brewery and our speedy delivery, they were able to open their doors for business. This option allowed the company to not only open, but save money. Making such quick repairs to their brick and mortar bathroom would have been costly with many permits and construction. Restroom trailers have allowed them to take time with repairs and spend wisely while still running business as usual. We are always happy to aid a wide variety of businesses affected by natural disasters. Our business with restroom trailers has given us disaster relief experience, allowing us to help those in need that much quicker and more efficiently. We will continue in our efforts to help businesses and communities rebuild and are always ready to use our expertise to provide needed relief. Please reach out if you have a need for restroom trailers. We have worked with a wide variety of customers, from construction sites to special events, businesses to specialty projects!